Door security bar holds door shut for added safety. Plastic head fits door knob or handle; plastic foot protects floor. Adjusts from 33 5/8" to 38 7/8"L.
Good to block a door in my Mom's home that has a great potential for the lock to fail if there's any breakin attempts. Helps me feel more secure in my home. This product is well worth the money!! I use this item as added security on my front door just slip it under the door knob and it helps prevent someone from forcing their way in!! Impressed how sturdy this product is! I had one of these security bars before. Unfortunately, I either lent it out and didn't get it back or I left it in a hotel. I wouldn't travel without one of these. Makes me feel much more secure. It can be used in a sliding glass door, also. Excellent item for that extra peace of mind when traveling...great for hotels, motor homes, or for your home. My daughter set the Security Door Bar and demonstrated how effective the product was. My neighbor tried to open my closed but "unlocked " door from the outside , using his shoulder to ram the door; and to my surprise the bar remain steadfast with very little give. Thank, Easy Comfort you gave me a winner!!! Happy I bought it. Peace of mind for good security. I came home early one morning and couldn't get in and couldn't wake up my mom and my niece. Works great. Bought one for my aunt for her apparment and am now buying one for her patio door. Works better than a chair and easier to use. A great find for doors that you can't put a second lock on and it's really needed. Gives my mom and my Aunt great peace of mind. I have ordered and used these door security bars for years. I also order them for my children to use in their homes. They are easy to use and very efficient. They are easy to take apart to pack and take on business trips and vacations also. Would buy it again if I need more. It arrived quickly and was easy to put together. I would get another if I needed it. It seems to be very sturdy and is securing the door very nicely. Good product.. I would recommend it to a friend. This is a great safety tool. Not only when you are at home, no one can "bust" down the door. It is also great at motels. I had my husband try the door after I installed the security bar. He couldn't budge it. This works until they finish installing the alarm system. Thanks! I am sorry to say that I am 85 years of age and I cannot put this bar together. It came in three pieces and I will have to wait until someone stronger than I can do this for me. I have had one of these before but it came intact--ready to use. The only thing wrong with my old one was that the plastic (or rubber) which went behind the doorknob cracked and I couldn't use it anymore. These need to be sold separately as they will not last as long as the bar itself. I put it at my front door and it goes against some steps there is no way anyone is getting in. This is my first experience with Miles Kimball. I was a little put off by negative reviews on the company but after this order, but not anymore. From online order to delivery everything went smoothly. I received prompt emails letting me know the progress of the order and whether I was satisfied or not. A pleasant experience overall. I was a little concerned that the tracking number was not recognized as i checked it periodically on the fedex site. Turns out fedex turns the package over to USPS at destination for delivery. I would buy from Miles Kimball again. This door stop is solid metal that does stop people from forcing the door open. I put my entire body weight into door without breaking it, and it would not budge. I BOUGHT THE FIRST ONE DOING THE SUMMER I WAS SO PLEASE WITH IT I END UP BUYING TWO OTHERS THEN MY DAUGHTERS WANTED ONE SO NOW I GOT TO BUT ONE MORE.THANKYOU THEY REALLY WORK . GREAT for home use. This securely holds the door in place and you can NOT jab a door in. LOVE this product. truly does work!!!! When I applied this to my front door and tried to open it from outside I was very pleased to find that even when using my key and trying to open the door it would not budge from the spot. The door would not open!!! Great safety device for apartment door. To secure inside door of apartment from intruders. I bought this for the extra security and peace of mind it gives me. It's easy to use and I know it works well because a friend with a key tried to surprise me (in a good way)and couldn't open the door while it was in use. I love the fact it is easy to take with me when I travel and gives extra security in hotel rooms. I have never seen anything so effective for security. I use this for my balcony door. I really love it. It even secures the door knob from moving. The security bar fitted tightly under my doors. I feel more safe. I use it on a back door and I will use it when I travel. Good product, it works just fine. To make my door is secured. This product provides a great sense of security in your home and is so very easy to use. I love the peace of mind that this gives me. This is the 5th Door Security Bar I've purchased because I am so happy with the product. I have two for myself, and the rest now belong to my children. Living in an area with high incidence of home invasion, I feel more secure using the Bars on my exterior doors (on the inside of the house), and have sometimes used one in the bedroom and even the bathroom while taking a shower. (Having already survived an armed robbery, I don't like uninvited guests, and I am very security conscious!) There are no "cons" to report, only the reassurance and confidence I have while using the Bars. Even if someone breaks thru' the door, at least I'll have a few seconds to call for help. Thank you, Walter Drake! I put it on my front door before I go to bed, and I feel confident no one can get in. Everything I thought it would be. Works extremely well. This is a must for anyones home. I sleep better at night knowing I have one more barrier to a possible break in. I have a front door that is half decorative glass - although I have a dead bolt lock, this gives me extra security. I use this bar on the front, back and bedroom doors of my apartment. The apartment has tile floors and using the bar placed on a (rubber back) throw rug works better than on just the tile floor. Let's face it...with apartment doors (not solid wood) this bar is not going to keep someone out, but it will give you extra time to make a 911 call and get your gun. 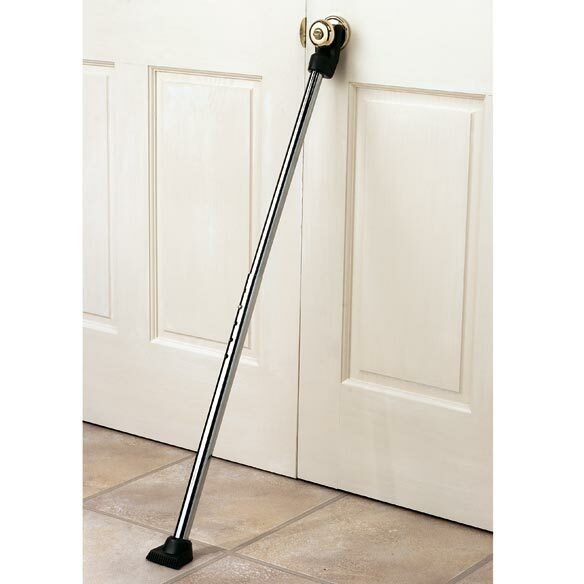 I really love the door security bar - I purchased two of them and gave one to my next door neighboor. The included instruction is poor. Contact Easy Comforts, & a better instruction will email to you. It works great. However, when you remove the bar from the door, the end pieces fall off. I bought 2 and each have the same issues. Otherwise, when in place it serves to keep intruders from coming through door. My daughter has her first apartment and feels better knowing the door is secure. you wont know if it works unless someone actually tries to break in. I love this product. It was easy to assemble. But the rubber tips slip off after use. They must constantly be checked to be sure it is still in place. But overall, works well. Height. I have a cane with same type of concept I know how the security bar should be adjusted but it is difficult. Once you finally get it adjusted it should work fine. I feel o k about the price but not the design. I had a 5 am home invasion and slept through it because i wear earplugs. Now my front door is very secure. so I bought your security bar just to make sure i wake up, if there is a next time, and they kick my bedroom door, it will just give me time to reach for my .45. I bought this thinking it would be made of the same weight of metal as the other 2 I'd bought before...it isn't. The metal in this one is much lighter and, to me, doesn't feel as strong as the others. I kept it, but not really happy with it. We have carpeted floors, and this does not work. You can still push the door from the outside. However, I do believe it would work on bare floors. I was not pleased with this item. Wish I had not purchased. I wish that I had never made this purchase. Difficult to handle with being disabled. Was disappointed with entire purchase! not along enough to reach any door knobs in our house. Did prop it up the best we could and our 10 year old grand daughter pushed it right over w/o any effort. It is a piece of junk. This door security bar was anything but secure. I tried every way to get it to work and still my young grandson came right in through the door. I sent it back as soon as I could and replaced it with the 2x4 bars that my husband made for each of my three doors. I regretted that I had to pay over $12. to ship it back. I felt like I got taken twice. Bought 1 and it works well. I have 2 other doors to use them on so I needed more. I need 2 more. I have 1 already. The item makes me feel secure. Even though my handle isn't round, it serves its purpose. I have a door security bar .. ordering this one for my niece. my mother has used one of these for her door. Thank God she did because there were a couple of teens that was trying to break in her apt and this item stopped them until police came. This provides extra security someone tried to break in our house this year. Thank the Lord in heaven the bar kept the robber from coming into our home. The price was better than in the store. But after shipping is added it makes it a few dollars more but the convenience ordering on line is easier fore me at the time. Waiting to see if the product is worth the price? do you ship to Alaska ? BEST ANSWER: Thank you for your question. Yes, we do ship to Alaska. Please allow 2-3 weeks for delivery. Will it still work on carpet? BEST ANSWER: I don't see why it won't. The length of the rod is adjustable to allow it to be pushed closer to the doors hence better stability. My bar is on carpet and it works better than on tile or hardwood. Yes, We have a small rug under the lower end of the bar. Yes, this product definitely works on carpet! does the bottom on the floor have non slip grip or rubbery ? BEST ANSWER: It is grooved and hard rubber. Good for wood or carpet floors. We take it on trips as well. Yes, the bottom has a non slip grip, works great. Yes, it has a rubber grip that works well. BEST ANSWER: Thank you for your question. You pull on the bottom while holding the top part. We hope this information will be of help to you. Hold it from the bottom of the bar and pull it towards you. Pull on the bottom while holding the top section. Will this work with lever handle and carpeting? can it be used on a sliding glass door? BEST ANSWER: Thank you for your question. Unfortunately this cannot be used on a sliding glass door. We hope this information will be of help to you. This is not designed to be used flat. the rubber foot grips the floor and the other slides under the doorknob. Does this work on an outswinging door? BEST ANSWER: This Security Bar works a lot like putting a chair against the door handle. For it to work the door must swing inward, and the door handle holds the top portion of the bar in place. For it to work most effectively the foot of the Security Bar should be around 8 inches from the edge of the door. The further away it is, the more the door can be pushed open. Even this way it's possible to push it open a very little bit. I noticed it's a lot more effective on a tile or linoleum floor, than carpeting. On carpeting it can slip a little. Thank you for your question. The Door Security bar will only work for a door that swings in. It will not be able to work on a door that swings out. We hope this information will be of help to you. Whai is the manufacture of this door security bar? BEST ANSWER: Thank you for your question. Unfortunately, we are obligated not to disclose the manufacturer information. We hope this information will be of help to you. what is the total length and manufacture of this bar please let me know asap thank you? BEST ANSWER: Thank you for your question. It adjusts from 33 5/8" to 38 7/8"L. We hope this information will be of help to you. how many pounds of pressure will it take? BEST ANSWER: Thank you for your question. It can take up to 94 pounds of pressure. We hope this information will be of help to you. will it work on carpet ? BEST ANSWER: With wall to wall carpet the bottom peice won't work as well but will still keep the door from opening... I wouldn't use it with a throw or area rug unless it has skid-proof bottom or carpet pad. Will this work on a sling lock? BEST ANSWER: Thank you for your question. No this will not work on a sling lock. We hope this information will be of help to you. Is it collapsible or shortened so it would fit into a 21" suitcase? BEST ANSWER: Thank you for your question. Adjusts from 33 5/8" to 38 7/8"L. It will not fit into your suitcase. We hope this information will be of help to you. BEST ANSWER: Thank you for your question. The Door Security Bar fits underneath the door knob and when propped up against the floor it makes if very difficult to open the door. We hope this information will be of help to you. Will this work on sash windows?